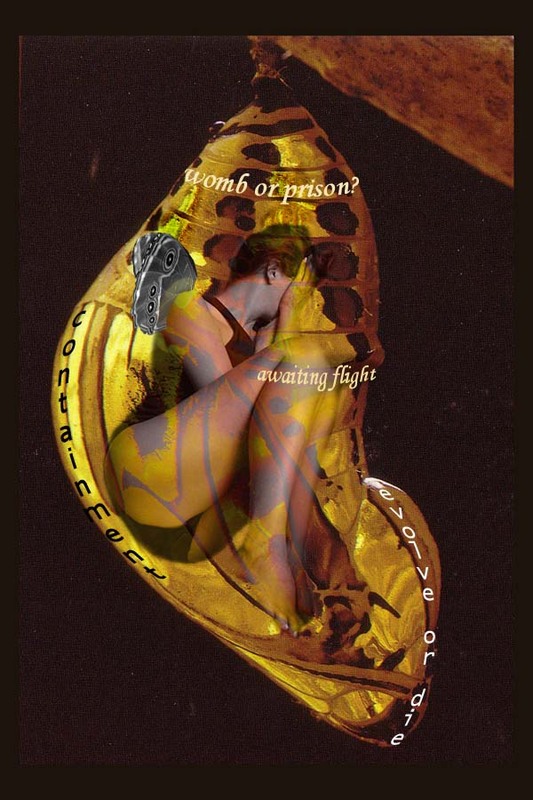 Home » Break free from what holds you back » Personal Freedom » Do you Need to Create a Chrysalis? If you are right now undergoing a change —or even more to the point— if you are actively working to change something in your life, then you need to create a chrysalis. My current chrysalis fed my dream of stepping into my radiance and allowing it to reach far out into the world, to touch a larger group of people. Remember how my New Year’s intention was to SHINE!? Remember that my New Year’s miracle was that I receive a book entitled “SHINE” with lots of stars and inspiration to shine… which I had NOT ordered? Well, I was working in my Star Chrysalis, and that is the type of miracles that happen when you gather your energy and attention to feed your dream. This Star Chrysalis– that’s the name of the Dream Chrysalis I created to unleash my radiance– facilitated me to develop, produce and publish my novel and to create a new performance for women’s empowerment that gathered my research, observation and conversations on women’s success and leadership for the last eight years, along with a program that is the continuity tool for the audience who wants to create their chrysalis. So what does it mean for a woman to create a chrysalis? Does she go into a cave? Does she goes into labor? Does she skip town? Is it like when you are doing a post-graduate course, that you lock yourself home to study and skip all social events? What does it look like? It looks differently for each woman and it is different each time you create a chrysalis because it depends on the intention, the dream or purpose that you are feeding inside that chrysalis. But one thing is essential to keep in mind: the chrysalis is not a defensive shell where the caterpillar hides from the world, however. It is a transitional skin, a Sacred Space that allows the Caterpillar to shapeshift into its highest potential: the butterfly. If you are working to manifest your Dream or committed to growing into your potential —for example, if you want to embody your purpose or play a bigger game in your field— then you need to create a Chrysalis. Finally, a chrysalis is the act of eating your Dream. That is a verse from my Butterfly Emergence poem. The caterpillar feeds on the chrysalis to become butterfly. We need to feed on our Dream in order to become that dream. Especially for women, who are the caregivers —and often the caretakers— of everyone around us; we need to set aside a sacred time and space to connect to Soul and allow it to guide us. What are my gifts, talents and skills and how can I integrate them to embody my purpose? How can I build a bridge to that new level I want for my work? What is holding me back from playing a bigger game, occupying my Seat of Authority or flying high into my potential? What can I do? Why are my actions ineffective and what new actions can I take? What is it that I truly want? What makes me deeply happy and fills my heart? How can I do this for a living or as a practice? What is it that I am resisting in my personal or professional growth? Why? How can I find a graceful path? Where do I need help? Who could help me? Who would be a good mentor or counsel? Where is my community of belonging for that new stage I want to grow into? Who am I truly in my sacredness, when I am an expression of The Divine? How am I already perfect for my purpose, just as I am now? Am I sitting on the Orphan or Victim Chair? How can I seat in the Creatress Chair and create the life I want? How can I bloom here and now, right where I am planted? The chrysalis becomes your growth laboratory. In that time and space you give yourself and your dream, purpose or potential undivided attention. It is your path of commitment. Push forward with our logical minds, following borrowed blueprints or standardize plans that may not be in harmony with our Soul. These may lead to a success; but it is not the success our Soul desires and therefore will not make us happy. The difference between here and “there” is a “T.” It stands for transformation. The chrysalis is the bridge that allows you to walk through that transformation in a way that honors your Soul, integrates your gifts and embodies your purpose. The chrysalis allows you to absorb your dream into your being, feed on it and grow wings from the inside out. Now you can join my Butterfly Woman Emergence Program to create your chrysalis and emerge as your embodied potential.